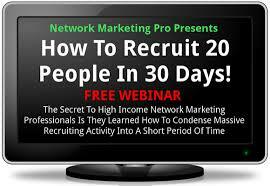 Eric Worre hosted a great webinar: How to Recruit 20 People in 30 Days. I took a lot of notes and wanted to share them with YOU! This webinar was full of great info, and I most appreciated how *real* he was with his participants. This business takes WORK. (We often joke that our industry is called netWORK marketing for a very real reason). But if you’re willing to commit — even if only for 30 days — the financial reward can be incredible. You need a 3 0-day game plan… but a 90-day game plan is better! Worre studied successful MLM-ers and determined 70-90% of income is attributable to a 90-day burst of activity. How much commission will you earn for bringing in 20 people? Other bonuses from the same activity? NOTE: If you bring the same 20 people in within 30 MONTHS instead of 30 days, the numbers would be 20, 8, 4, 1, 0. But if you do that within 30 days…. Success Loves Speed!! !